Community Supported Agriculture may be an idea whose time has come. Let's face it, all of us don't have either the time or space to grow enough vegetables to feed our families. We then have to purchase our produce elsewhere. Information available from the University of Massachusetts states that "Food in the U.S. travels an average of 1,300 miles from farm to supermarket." While fuel prices have dropped from last summer's highs, they will probably go up again. Even so, does it really make sense to buy tomatoes from California when they are in season just down the road? A solution to this dilemma is Community Sponsored Agriculture (CSA). CSA's are a partnership of sorts between the farmer and a group of local residents. What CSA's do is re-connect the consumer with the grower. With this re-connection comes the sharing of the risks of farming. The consumer's share of the crop will be less if a portion of the crop fails. Conversely it will be more if there is a bumper crop. 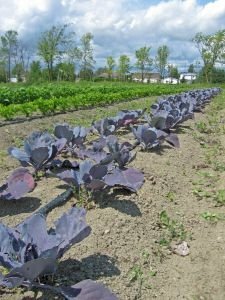 Each year, usually in the spring, the members of a CSA purchase a share of the coming year's production. This allows the farmer to concentrate on doing what he does best, growing food, and eliminates the need for him to market his produce. It also helps the farmer operate in a more stable economic environment. The consumers benefit from knowing where and how their produce was grown and handled- especially important in these days of disease outbreaks from contaminated produce. The farms benefit from the elimination of monoculture farming practices. These practices came into existence with the use of large machinery and chemical fertilizers and pesticides that made monoculture farming economically viable. While these farming practices have made it possible for the US to feed the world, they have also helped to eliminate the small family farm and individual market gardeners. CSA's enable farmers to respond to the needs of their customers by the communication that takes place with their members. They also keep dollars in the community and provide farmers and consumers with a fair return on their investment. Because the farmer needs to provide a variety of fruits and vegetables, the biodiversity of the land is maintained and built upon. What most Community Supported Agriculture operations are not is a farm market. They usually have fairly strict rules on pick-up of the member's shares. Since they are working farms, they usually do not allow members to wander about the farm. Some do allow for share holders to work on the farm to mitigate the costs of a share. As mentioned above, there are many variables in farming and the amount of food is not guaranteed. The CSA is not for you if you expect picture perfect fruits and vegetables. The produce is divided up equally, so everyone gets an equal share of quality as well as quantity. Community Supported Agriculture is becoming more popular. They are springing up around and sometimes in urban centers. The popularity is in direct proportion to the demand. Here in NE Ohio, if you haven't got your share by now, you're probably shut out for this year, and by one estimate there are over 3,000 shares available this year. For a listing of CSA's near you visit the Robyn Van En Center for CSA Resources. Visit the website of Basket of Life farm, located in the historic Cuyahoga Valley National Recreation area for a look at a well run CSA.